Have you ever been frustrated because the record you were seeking was held behind a paywall? Have you ever been suspicious that the record you are trying to find online is not there at all? You aren’t alone! Reclaim the Records seeks to put public records online, for free, for everyone. 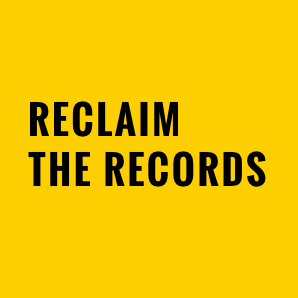 Reclaim the Records is a non-for-profit group of genealogists, historians, researchers, and open government advocates who are filing Freedom of Information requests to get public data released back into the public domain. They do this by collecting information about archivally important data sets that are not available online or on microfilm. Once they identify a set, they use Freedom of Information laws and Open Data initiatives to get copies of that information released back to the public. Their work started in archives, libraries, and government agencies in New York, New Jersey, and Missouri. They are expanding into different parts of the country. Interested genealogists can visit the Reclaim the Records website and check out their to-do list, take their records survey, or sign up for their newsletter. You cannot donate money to Reclaim the Records. They are a not-for-profit group, and they don’t want any funds. You can, however, donate some of your time by filling out their survey and letting them know about genealogical and historical records that are being unfairly blocked from public access. In January of 2015, Reclaim the Records launched their pilot project. They were seeking access to the 1908-1929 New York City Clerk’s Office marriage license, applications, and affidavits. The reason they chose this particular set of records was because it was only available onsite at the New York City Municipal Archives in lower Manhattan. The records were only available in microfilm. Reclaim the Records wanted to get copies of the records, scan them, and put them online for public use. There are interesting details on the Reclaim the Records website about how they managed to finally obtain those records. It involved going to court. Reclaim the Records received the majority of the 450,000 records they requested in mid-October 2015, as a set of 46 microfilms. The final two microfilms were delivered to Reclaim the Records in January of 2016. After all the records were digitally scanned, Reclaim the Records uploaded the images to the Internet Archive. Those records are now free and open data forever, and do not have any copyright or usage restrictions.